This sofa won me Upholsterer of the year!! Ted was chosen as one of Upholstery Journal's 2004 Upholsterer's of the year. Thanks to his commercial partner, Cheryl, who submitted his profile and application. Each Year, UJ chooses 3 upholsterer's from each region. 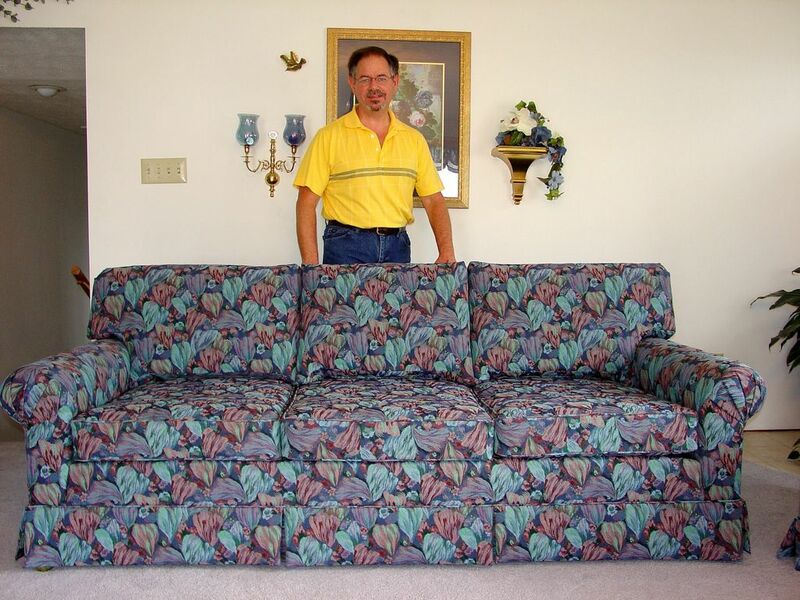 He was chosen from the 10 state Midwest region for the custom built sofa above. Howard's Upholstery builds high quality upholstered furniture that looks better and outlasts mass produced manufactured furniture. Folks, it is not hard to do. Did you know that the factories push out a sofa every 10 minutes? Most mass produced furniture is built in Asia and South America. They skimp on quality by using such things as plastic legs, cardboard arm shapers, poorly made plywood frames that incorporate low quality methods of joinery, to few springs or no springs at all, cheaply lined skirts, low quality dust covers, dacron only filling in the inside backs and poor quality sewing- just to name a few. This is very typical of new sofas selling for less than $1700. Howard's do these kind of warranty repairs for local dealers weekly. Custom built upholstered furniture is the answer to obtaining quality. For pricing, choose your frame and fabric from the links on the top right sidebar of this page, send this information to: tedhoward52@gmail.com for a free quotation.